There are a handful of games I tend to avoid playing. It’s not because they’re bad games, mind you. It’s just–simulation games (like SimCity or Animal Crossing), MMORPGs, and (the worst offender)…puzzle games tend to bring out the worst in me as a person. Show me a good puzzle game, and I’ll show you my future—horrifying images of me curled up into a ball with messy hair wearing clothes from three days ago as I rock back and forth putting hour after hour into achieving the highest possible score. The unthinkable happened not too long ago—Renegade Kid announced a puzzle game. The creators of Mutant Mudds were going to try their hand at a completely different genre. Their game has bombs in it. Tetris—with explosive power. I knew better, but I just had to buy it. And I may or may not be convinced that everything Jools Watsham touches turns to gold. 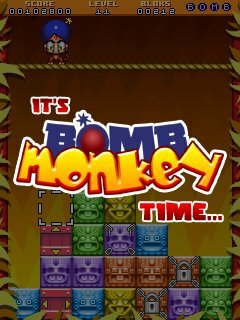 But I suppose that’s just a side effect of my latest addiction—Bomb Monkey, from the Nintendo eShop. The game turns the puzzle genre on its side—literally. The game is played by turning your 3DS to the side, as if you were holding it open like a book. The top (technically left) screen is occupied by a zany monkey that does little more than dance or play drums, and the bottom (right) screen is where all the gameplay takes place. I assume the side-ways playing was to allow for a bigger puzzle arena, and it accomplishes that. The game controls either by using the d-pad (the directions are fitted accordingly to accommodate a sideways 3DS) or the stylus. I assume the stylus controls work exceptionally well for right-handed gamers (the majority), but left-handed folks are probably going to stick with the d-pad. It would have been nice if the screen could be flipped to accommodate lefties, but I can’t honestly complain since the d-pad is a perfectly acceptable alternative. The game is reminiscent of Tetris Attack. The goal is to get as many colored blocks together as possible so that when you blow one up, all adjacent blocks of the same color go with it. 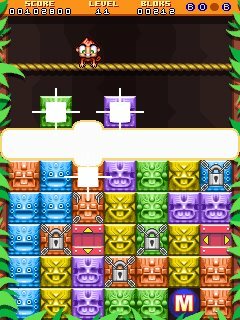 You control the monkey as he moves across the top of the arena, dropping blocks or dropping bombs. Gameplay is made slightly more complex by the inclusion of keyed blocks (these take more than one shot to blow up), more powerful bombs that can cover a much wider area of the arena, or the arrowed blocks that, when blown up, cause a horizontal or vertical explosion that destroys tons of blocks in either direction. My favorite part of the entire game, however, happens when the player blows up the letters “B” “O” “M” and “B” that appear as the stage progresses. The game announces—it’s Bomb Monkey time, and a slew of explosives are at your disposal to completely obliterate the arena as the swanky music plays. Bomb Monkey has several modes of play. Far and away the most popular is probably Endless, which functions just as it sounds—achieve the highest score possible until the “game over” screen rears its head. There is also 3 Minutes, a score attack meant for bite-sized chunks of play, Rescue, where the goal is to bomb a certain square (that happens to have your caged friend within it) some forty-five times are so, and Numbers, where the goal is to bomb certain spaces in a certain sequence of…numbers. If I had to rank these modes, it would probably be just as I’ve listed them, in order from most fun to least fun. I tend to fluctuate between 3 Minutes and Endless depending on whether I’m in the mood to let hours of my life go by, as I fall victim to the worst kind of addiction—or strictly gauge myself to play for a three minute interval…again, and again, and again. Rescue and Numbers will probably be fun for puzzle fans seeking a more versatile, complex form of gameplay, but I like to stick with the simple stuff. Also worth noting: the game has a few local multiplayer modes. I had the chance to experience both. The two player modes function by allowing the player sitting to the right to control an arena on the top screen using the A, B, X, and Y buttons like a d-pad—while the player on the left controls the touch-screen via d-pad or stylus, as normal. It’s great that this kind of stuff is included, but the 3DS screen is far too small to comfortably accommodate this mode of play. I assume fans of 2 Player Bomb Monkey will be happy when the 3DSXL hits store shelves. You can either play co-op as you both pool together your scores for the highest score possible, or versus—where the blocks exploded on one screen wind up in the other. Reviewing a puzzle game is admittedly a daunting task. It’s certainly addicting, and it’s certainly charming. The visuals, the music, the interface—they’re all strong enough to justify the game’s price. But I have to subtract a point from this game because of what it lacks—namely online play (because competing with someone online would arguably be much more comfortable than the local multiplayer options), and leaderboards. Jools seems to have addressed the latter of my two issues with the game by creating an Online Leaderboard Website… but it doesn’t accommodate your friends’ individual scores, and as far as I can tell it only features Endless mode. I’d have paid a few bucks more for the game if a fully functioning leaderboard was included that hosted the scores of friends and regional fans. Half of the draw of a puzzle game is its addictiveness, but the other half is its competitiveness. And while Jools certainly put forth a good effort, it’s just not what it could have been. All in all, Bomb Monkey has been a blast to play. It truly shines as one of the best puzzle games available on the eShop, but it has its fair share of flaws as well. $4.99 is a perfectly sound price for the amount of (addicting) content offered. And the free leaderboard website was a nice touch as well. 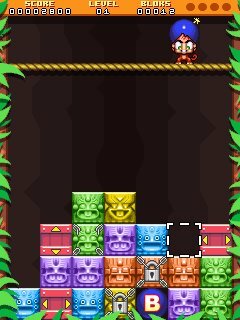 Bomb Monkey was released on the eShop on June 28th in North America. It will be available in Europe soon enough (don’t worry—you won’t be waiting nearly as long as you had to for Mutant Mudds).